History and culture of Egyptian Nubia: its great past and glorious achievements, lost historical and cultural heritage of Nubia, and present state of Nubian people in Egypt. Nubian man at his house. 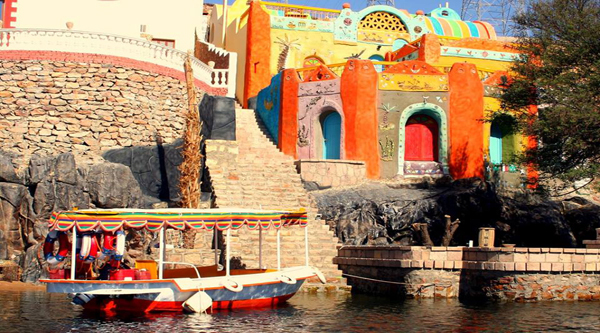 A beautiful house of Nubians. The loss of Nubia was one of the world's great tragedies. Not only did it mean the inundation of an entire land and the loss of its ancient monuments, but it uprooted an entire population from its native soil. Nubia was one of the few places remaining on earth that was unspoiled by humanity. It was a harsh and barren land to be sure, but it was one to which the people had, and indeed have until today, a strong attachment. Nubians first became victims of forces beyond their control when the Aswan Dam was built at the turn of the 20th century, and subsequently heightened on two occasions. Each time the Nubian residents - their settlements necessarily built on the narrow floodplain of the Nile - were obliged to move to higher ground as their land became progressively inundated. When in 1960 they were told that their entire land would be lost once the High Dam was completed, and that they would have to start a new life far from their ancestral homes, they found it difficult to believe. Nevertheless, they were relocated, 50,000 of them, on Egyptian soil. They are now in their second generation as Egyptian nationals, but Egyptian Nubians are nevertheless sensitive to their ethnicity. Proud people of Nubia lost their land in the early 1970s, now submerged beneath one of Africa 's largest man-made fresh water reservoirs - Lake Nasser . The lake, some 360km long in Egyptian territory and a further 140km in adjacent territory in Sudan , virtually plunged what was once known as Lower Nubia . Nubia had become a somewhat idealised homeland for most of its men, forced by economic circumstance to migrate north to Cairo and other Egyptian and Arab urban centres for employment, returning briefly during holidays and finally at the time of retirement. The Nubian migrants would talk of their villages "as places of peace and honesty; a 'blessed land' they would say, free of the strife and conflict of urban life". Nubia was an isolated, sheltered place, out of the purview of strangers, including government administrators. "The beautiful villages along the Nile with spacious houses and groves of green palm trees were a place of peace and tranquillity. So who are the Nubians? In ancient times the inhabitants or at least the ruling cliques of the highly stratified and hierarchical societies, of Lower Nubia adopted Egyptian attire. Their priests, like their Egyptian counterparts, donned sacred leopard skins. Their rulers, however, were invariably depicted by the Egyptians as wearing a headdress distinguished by a sole upright feather - which in Egypt's New Kingdom's iconography denoted a southern adversary. A love- hate relationship developed, which is curiously commonplace even today. The contemporary Nubians are the indigenous peoples of the central Nile Valley who live along the narrow patches of fertile land that snakes through the desert and forms a gigantic letter "S" in northern Sudan and the southern tip of Egypt . They are a people whose precise origins are unknown, but whose elders today converse in four closely related Nilo-Saharan languages known collectively as "Nubian". Nubia was the meeting place of the Mediterranean and African civilizations, people of Nubia are neither Upper Egyptians nor Arabs. They are Nubians, they are distinctive racially from the rest of Egyptians - then and now the darker complexion of the Nubians was a defining characteristic of their unique identity and a distinguishing factor from Upper Egyptians. Language was yet another differentiating factor. However, it is clear that in ancient times - from the pre-dynastic era to the dying days of the Pharaohs - the distinction between Upper and Lower Nubia was as marked as that between Nubia (Upper and Lower) and Egypt (Upper and Lower). The Nubians have a very distinct tradition of celebrating the Muslim festival of Ashoura and that bears little resemblance to Islam and that is reminiscent of ancient legends from the remotest past. There is an intrinsic and symbiotic relationship between Osiris and Al-Hussein, this is an integral part of their culture. It also denotes their cultural specificity. In the Nubian mind, Al-Hussein is very much associated with Osiris. Indeed, the martyrdom of Hussein is reminder of the assassination of Osiris. He revels in facets of Nubian culture and calls his listeners' attention to the minutiae and particularistic nuances of Nubia 's cultural heritage. The cross is to this day a powerful symbol of Nubian cultural specificity and is frequently used as a motif to embellish buildings, Nubia was a Christian land for more than a millennium before its inhabitants adopted Islam as its own religion. The curious phenomenon is that Nubian women are far more determined than the men to act as depositors of the past. Nubian women are especially proud of their cultural heritage. The women of Nubia like to show their traditional crafts and festive abilities, but also the succulent food they are renowned for, like the fresh weika (a relative of okra). For 50 years, it was the Nubian women who kept the cultural heritage of their people alive even as their land was inundated. Nubian women until today tell tales to their children in the Nubian dialect. When they make plastic baskets for utilitarian purposes and for sale to tourists, they recall the time when they were woven from the natural fibres of Nubia 's sacred palms. They chant Nubian songs, perform traditional dances, marry within their own, and even the concrete houses that were built for them when they resettled in Kom Ombo have been lovingly adorned with colourful façades reminiscent of their neat domed houses in Nubia, their walls sometimes finger-painted with pictures of chickens, scorpions and other sacred symbols, or with records of their pilgrimages to Mecca. 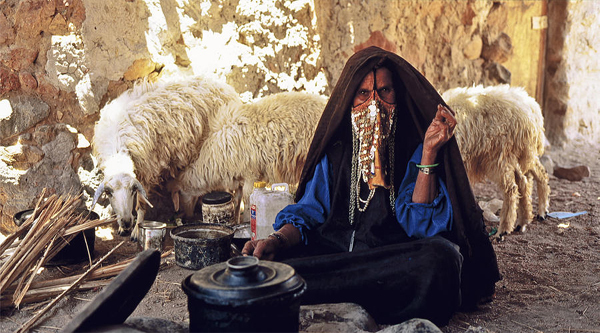 Nubians have a strong sense of regional identity, they ware their distinctive white robes and turbans. The Nubian women, like the women of Upper Egypt or the Sa'id, are traditionally draped in uncompromising black. The traditional black tob of the Nubian and Sa'idi women is an outer garment worn over more colourful dresses. The fishermen of Nubia would hunt crocodiles and stuff them with straw, hanging them over their doorsteps as talismans to protect against the evil eye. The crocodile's mouth was left open, but the body was draped with colourful beads. For the people of ancient Egypt , the olom , as the Nile crocodile is known in the Nubian dialect, was much more than a good luck charm. In the time of the Pharaohs he was worshiped as the god Sobek, in whose honour the temple of Komombo was erected in Upper Egypt . Nubian villages were built of stone, clay and sand, the roofs usually of jareed and grain stalks. The floors were covered with clean sand and household utensils for everyday use hung from the ceiling. Models of Nubians in traditional houses carrying out various domestic, social and agricultural activities that reveal the traditional way of life can now be seen in the Nubia museum in Aswan. There is even a painting of the weekly Post Boat that once stopped at each of the 46 districts of Nubia en route to Wadi Halfa from Shellel, south of Aswan , carrying mail and supplies. Some 35 per cent of the vocabulary of the Nubian language of Faditcha and 20 per cent of Kenuz have Meroetic origins. Accordingly, there are also Meroetic connections with a number of African languages including the Fur of Darfur, and certain languages spoken in Kordofan in western Sudan , Chad and Ethiopia . There is a strong connection between the contemporary spoken languages of Nubia and those of Africa south of the Sahara . However, polemics aside, Meroetic declined with Christianity and Old Nubian developed influenced by Coptic, Greek and Latin and written in Coptic and Latin script. However, it was the same language spoken in the pre-Christian Meroetic kingdoms of Nubia . The Nubian Christian Church and kingdoms had strong affiliations with the Ethiopian Church . Nubia , however, had the upper hand at first. It was in the 14th century that the Ethiopian Church became more prominent and the Nubian Church declined. Nubia was Christian before Ethiopia . 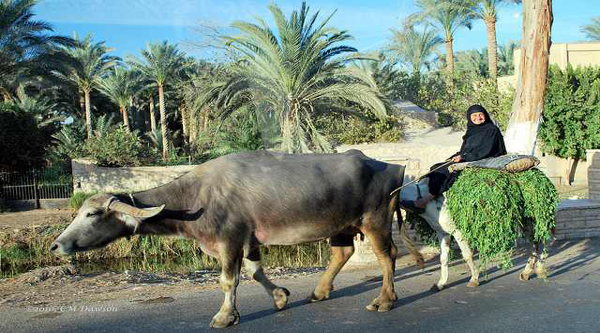 Conversion of Nubians to Islam was a peaceful process and was pre-empted by trade. There are Nubians, certain tribes, with Arabic origins. They are a mixed race people not of pure Nubian stock.